Are you planning a trip to Munster, the south-western province of Ireland? Here you'll find (almost) everything that you need to know about the Irish Province of Munster, from the geography and history of the region to the counties actually part of this remote yet often visited corner of the “Emerald Isle”, including the best sights and attractions of Ireland's South-West. Munster, or in Irish Cúige Mumhan, encompasses the Southwest and is Ireland's largest province. The counties of Clare, Cork, Kerry, Limerick, Tipperary, and Waterford make up Munster. Major towns are Cork City, Limerick City and Waterford City. The rivers Bandon, Blackwater, Lee, Shannon, and Suir flow through Munster and the highest point within the 9,315 square miles of the area is Carrauntouhill (3,409 feet making it Ireland's highest peak). The name "Munster" derives from the old Irish kingdom of Mumu (not to be confused with the Mu Mu Land Tammy Wynette sang about) and the Norse word stadir ("homestead"). Long subject to wars between local kings, some sort of stability was gained in the 10th century. The Munster king Brian Boru became High King of Ireland at Tara. This "golden period" lasted into the 12th century, later parts of Munster declined into a provincial backwater, with the important towns and seaports of Cork, Limerick and Waterford being notable exceptions. Munster has a number of attractions that are amongst the top ten sights of Ireland - from the Cliffs of Moher to the hustle and bustle of Killarney. Further top Munster attractions include the Ring of Kerry. A holiday in Munster alone could encompass outdoor activities as well as cultural food-for-thought - the sheer size of the province and the presence of many Munster attractions making this possible. A large number of vacationers, however, prefer to relax and do virtually nothing in the relatively warm and sunny Southwest. Clare (in Irish An Clár) spreads over 3,188 square kilometers. County town is Ennis (once celebrated as Ireland's first "digital town"), the numberplate indicator uses the letters CE. The county name stands for a “flat plain” – those who hit the Cliffs of Moher and the Burren on their travels might disagree, the two major attractions of the county are everything but flat. County Clare's nickname “Banner County” goes back to the tradition of carrying large banners to the “monster meetings” of the 19th century (large-scale meetings, not to be confused with a Scooby Doo villains’ convention). Clare people are still prone to wave lots of flags in GAA games ... keeping the tradition alive. Cork (in Irish Corcaígh) is the largest of the Irish counties at a size of 7,459 square kilometers, with many stretches sparsely settled. County town is Cork City, though those living in the city tend to see themselves as quite distinct from rural Corkonians. The numberplate indicator letter is C. Favourite nickname of Cork is “the Rebel County“. Within the GAA, players from Cork are also known as (simply) “Leesiders” or (slightly insulting) “Donkey Eaters” – apparently Corkmen were prone to eat anything during the Great Famine of the 19th century. The name Cork describes literally marshy ground - which still holds true in many parts, with flooding being an unwelcome yet regular occasion. An introduction to County Cork can be found elsewhere. Kerry (in Irish Ciarraí) is the most tourist-friendly county in Munster (and maybe all Ireland), the famed Ring of Kerry being a must-do road trip. Though the county boasts 4,701 square kilometers, most tourists tend to favor a relatively small area near the Atlantic Ocean and around the lakes of Killarney. County town is Tralee (famed for roses), numberplate indicator letters are KY (Kerry). Though the common nickname for Kerry is “the Kingdom”, the name in itself references the “descendants of Ciar”. More information on County Kerry and Killarney can be found online as well. Limerick (in Irish Luimneagh) is maybe the most underrated county in Munster, across Ireland it suffers from negative connotations (see below), stemming from just a few patches of its 2,686 square kilometers. Limerick City is the county town, numberplate indicator letters are L (for cars registered in Limerick City) or LK (for those registered in County Limerick). The name Limerick stands for a wasteland - which may seem strangely fitting in some areas. Nicknames are the neutral “Shannonsiders” or “Treaty County” (referencing the Treaty of Limerick). Limerick City, however, is more than often and never humorously known as “Stab City”. Though cynics say that this name is far outdated, with local gangs using much more sophisticated weaponry in their turf wars these days. Tipperary (in Irish Tiobraid Árann) stretches over 4,255 square kilometers. County towns are Nenagh and Clonmel, the numberplate indicator letters were TN (Tipperary North) and TS (Tipperary South) respectively, now amalgamated into a simple T. The name means “well of the Ara” – nicknames are the sort “Tipp” and “the Premier County”. As the inhabitants of Tipperary were not known for their peaceful demeanor, in GAA circles players are also called “Stonethrowers”. An introduction to County Tipperary can be found here, and you may also find out why it is a long way to Tipperary. Waterford (in Irish Port Láirge) encompasses 1,838 square kilometers. County town is Dungarvan, the numberplate indicator uses the letters WD (for County Waterford) or simply W for Waterford City. More information on County Waterford and Waterford City can be found by following those links. Nature is the main attraction in Munster, with West Cork and Kerry being especially highly regarded as beauty spots. Signposted drives along the coast will take you to the most famous areas. Munster is also a very much geared towards tourism. Meaning you won’t really be alone most of the time. The Cliffs of Moher - An undulating landscape suddenly ends in a sheer drop of more than 650 feet, straight down to the Atlantic. The Cliffs of Moher are one of the most spectacular coastal areas in Europe. The visitor center has been rebuilt on a grand scale, as has the pricing structure, making this one of the more expensive treats. The Burren - Wedged between the rough beauty of the Aran Islands and the bustling university city of Galway, the near featureless desolation of this limestone plateau of the Burren has often been likened to a moonscape. Ancient monuments and bizarre rock formations abound. Some spectacular sights can be taken in by driving next to Galway Bay. 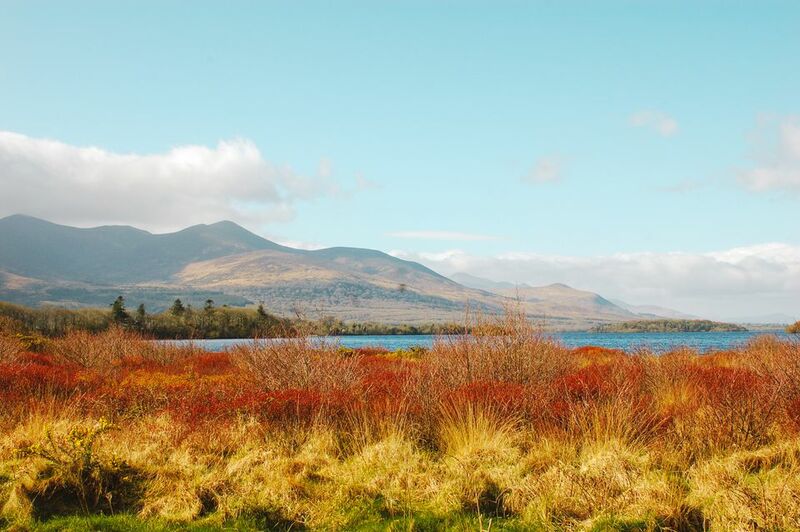 The Lakes of Killarney - If you want to experience spectacular coastal scenery, breathtaking mountain landscapes, ancient monuments and the tranquil old-world-charm of Killarney's lakes, castles, and houses, this is the place to go. Bear in mind that thousands of tourists will have the same idea - the best time here can be had both sides of the summer months. The Ring of Kerry - One of, if not the, most famous signposted drives in Ireland. The "Ring of Kerry" leads around the spectacular coastline from Kenmare to Killorglin with the road via Killarney completing the ring. Best done outside the tourist season. The Beara Peninsula - The Beara Peninsula strikes out into the Atlantic and is definitely worth a visit. From the desolate and aptly named Hungry Hill to the fishing port of Castletownbere, from the breathtaking views on Healy Pass to the no less breathtaking ride in a cable car to Dursey Island. Great walks can be had on Bear Island (ferry from Castletownbere), or visit the ruins of tragic Dunboy Castle for some shivers. Cobh, the Former Queenstown - If Ireland has a town that conveys a certain Mediterranean mood, Cobh would be it. Colorful and quaint, with a huge cathedral towering over Cork Harbor and historical connections. The town was once known as Queenstown and the last port of call for the Titanic before her fatal encounter with an iceberg. And hundreds of dead from the sinking of the Lusitania are buried in mass graves locally. Charles Fort and Kinsale - Guarding the entrance to Kinsale Harbor, Charles Fort is one of the most impressive fortresses you may visit in Ireland. Though partially destroyed by the IRA in the 1920s the massive complex, incorporating a petite lighthouse, is still a symbol of military power. The town of Kinsale itself has reinvented itself as a gourmet heaven. The prices certainly reflect it, but a walk through the nicely presented town center is free. The Dingle Peninsula - The town of Dingle is the main attraction here, famed for pubs, restaurants and folk music. And an aquarium. It is a tourist resort at heart, but still has the certain charm of "the auld country". Fungi the Dolphin is another, much-overrated attraction. For splendid views of almost the whole Dingle Peninsula, drive up the Connor Pass or climb Brandon Mountain. The fairly short Slea Head Drive is well worth the time for the view of the Blasket Islands alone, do not miss visiting the Blasket Centre on the way. The Rock of Cashel - This historic place is visible for miles from the new bypass and definitely worth the detour. Basically a collection of ecclesiastical ruins on top of a hill, collectively known as the Rock of Cashel, it has a varied and quite exciting history. Read up on the history, and enjoy the excuse of a nobleman who burned the complex down, saying in his defense that he "thought the bishop was still inside!" Bunratty Castle and Folk Park - The tower house of Bunratty was built in 1467 by the O'Brien family and has been renovated with no expenses spared. A medieval banquet is offered in the evenings, complete with period entertainment. During the day, the adjoining Bunratty Folk Park allows a glimpse into Ireland's past. Is the Wild Atlantic Way Ireland's Ultimate Road Trip?